A Raelian Guide welcomed by organizers of Zacatecas Gay Pride. On the evening of August 16, 2013, banners in hand, the Raelian Guide Lucero Castillo walked to the Plaza Garcia, in Zacatecas, Mexico, where gathered the organizers of the Zacatecas Gay Pride. She was welcomed with great respect by the organizers and she explained them the goals of ARAMIS-International towards sexual minorities, how the organization was founded and who created it? She was very enthusiastic to talk about the Raelian philosophy and proud to mention that the founder is Maitreya Rael. The women organizers immediately congratulated her for the excellent support she brought them. The lesbian organizers wanted to help holding her banner and invited her to ride in the vehicle with which they would parade. The parade started at 20:30,; and what a night! Journalists were constantly photographing and filming ARAMIS-International banner. Another demonstrator has offered to carry the banner with one hand while the Raelian Guide Lucero Castillo was holding it on the other hand, distributing very moving leaflets about the Raelian philosophy to the gay community. "The organizers did not allow the participation of heterosexual people, but they allowed me to take part in the LGBT Pride. 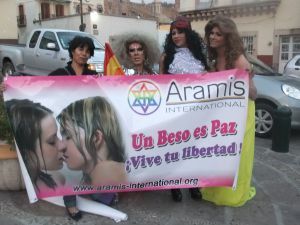 What a pleasure to see the participation of ARAMIS-International in the Gay Pride of Zacatecas in Mexico ... there was so much love. said Lucero Castillo. For the Raelian philosophy, humanity was created by a humanoid civilization from another planet and for us all sexual orientations, whatever it can be, are innate and not a choice; and this apply to every human being, whether the person is heterosexual, bisexual or homosexual.